Every year, I make a list of the top three fiction books (. I couldn't possibly pick only 3 mysteries. That would be too hard). These are the books I tell people about over and over again. Funnily, I listened to all of these on CD and I didn't realize until I made this list that they're all set in other countries. Because I have two little kids I don't travel much, but these fictional escapes to England, Ireland, and Ethiopia transported me completely. I loved the characters, the writing, and the stories stayed with me for weeks afterward. Now that's a good book. Your turn! If I missed a fantastic book in 2010, let me know about it and I'll pick it up in '11. I really enjoyed CUTTING FOR STONE as well. I've got the other two on my TBR list and hope to get to both of them this year. I really liked the book STILTSVILLE by Susana Daniel in 2010. It's set in Miami of the 1960's-1990's. The last few months the only thing I have been listening to is the Harry Dresden series by Jim Butcher. James Marsters does a magnificent job reading them. 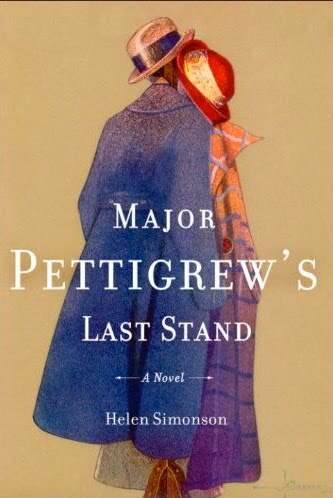 Absolutely loved, loved, loved Major Pettigrew's Last Stand!! Another really good one I read this year was How to be An American Housewife by Margaret Dilloway. For mysteries, ( besides Killer Plot :)) I really liked Bury Your Dead by Louise Penny. I can never just pick 3 or ten or even more. In fact when I blogged about my favorites for 2010 I had to break down into genres. Three books I really enjoyed that were not cozys (my usual mystery read) were Two Tickets To The Christmas Ball - a very feel good pleasant holiday read. And I ran into the author at an event at Borders and snagged an autographed copy; Christmas at the Mysterious Bookshop - this is a collection of short mysteries. The bookshop really exists and I want to go visit. And my favorite children's picture book for 2010 and I'm crossing my fingers that it wins the Caldecott is Chalk by Bill Thomsom. It's a beautiful book. I loved Faithful Place (which is the only one of the three I've read)--it's one of those books that makes me jealous. What a great voice! Only one book? Sigh. I have to say I've struggled with Louise Penny's books (although I seem to have read them all, seeking what other people have seen in them), but I thought Bury Your Dead was wonderful. It finally all came together for me. Almost all of my reading in 2010 was older cozies. I was playing catch-up on new to me authors. I did read The Help and it has stayed with me. Your list will definitely go on my TBR list. One of my book groups will read CUTTING FOR STONE in a month or two. Glad to know it might be good because I don't like this month's (ELEGANCE OF THE HEDGEHOG). I couldn't get into MAJOR PETTIGREW. I am really liking my current book - COWBOYS NEVER CRY by Tina Welling. Here are a few 2010 releases that might not be mentioned that I enjoyed: "The Scent of Rain and Lightening", "So Cold the River", "The Night Fairy" and "Caught". I also loved "The Hunger Games", and the final book in the trilogy was released last year. I read the Odd Thomas series by DEAN KOONTZ and loved it! Good on audio, too. And even though INHUMAN CONDITION (my own book) is not on audio yet, I gotta recommend it - 21 fab short stories to make your heart race! (Here's a link: http://www.amazon.com/Inhuman-Condition-Kate-Thornton/dp/1603640339 ) There is even a cozy or two in the mix...! I enjoyed the Hunger Games trilogy as well, though the first book was the best IMO. As for Elegance of a Hedgehog - I really never got into it. I read the whole thing and will say that one of the most beautiful lines in literature occurs near the end, but I never warmed to any of the characters. I love mysteries and read 2 -3 a week. It is so had to just pick a few when I truly enjoyed them all. One of my favs this year Stork Raving Mad, the latest in the Meg Langslow series by by Donna Andrews. I really enjoyed The Poacher's Son by Paul Doiron. Great writing, interesting characters and one heck of a twist. I will have to agree with The Hunger Games trilogy. Read all of them in 2010. LOVE Cutting For Stone. I read 51 books in 2010 and it was my favorite. I also liked book one of The Hunger Games the best. An interesting blog would be, what is your favorite line(s) from a recent book. Mine would have to be from Tinkers..."What of miniature boats constructed of birch bark and fallen leaves, launched onto cold water clear as air? How many fleets were pushed out toward the middles of ponds or sent down autumn brooks, holding treasures of acorns, or black feathers, or a puzzled mantis? Let those grassy crafts be listed alongside the iron hulls that cleave the sea, for they are all improvisations built from the daydreams of men, and all will perish, whether from ocean siege or October breeze". While I liked Hunger Games, I didn't think it was the best read (or set of books) I read in 2010. I loved Remarkable Creatures by Tracy Chevalier and it's a toss up between Kraken or The City and the City, both by China Mieville. I also enjoyed The Bells by Richard Harvell. See... I can't pick just one. I never do top ten lists or fewer because I can't never pick so few books. (The Help by Katheryn Stockett was fabulous but I read that in 2009). THE PASSAGE - Justin Cronin was my absolute favorite of the year. It was epic and more than a vampire story. And I listened to it as a BOCD too. Love my audiobook time. Someone telling me a story helps me get through the commute.